In this volume charity commissioners and leading charity policy reformers from across the world reflect on the aims and objectives of charity regulation and what it has achieved. 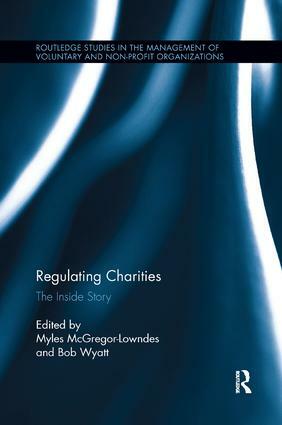 Regulating Charities represents an insider’s review of the last quarter century of charity law policy and an insight for its future development. Charity Commissioners and nonprofit regulatory agency heads chart the nature of charity law reforms that they have implemented, with a ‘warts and all’ analysis. They are joined by influential sector reformers who assess the outcomes of their policy agitation. All reflect on the current state of charities in a fiscally restrained environment, often with conservative governments, and offer their views on productive regulatory paths available for the future. This topical collection brings together major charity regulation actors, and will be of great interest to anyone concerned with contemporary third sector policy-making, public administration and civil society. Myles McGregor-Lowndes is a professor and the founding Director of the Australian Centre for Philanthropy and Nonprofit Studies at the QUT Business School, Australia. Bob Wyatt is executive director of The Muttart Foundation, a private Canadian foundation that has engaged in issues of charity regulation for more than two decades.